Beach Condo frontal con vistas espectaculares de la bahía de Acapulco y un lugar muy tranquilo para quedarse, nunca se llena. Ver el maravilloso del Pacífico. Relájese en la terraza y disfrutar de la puesta de sol. Ubicar en el corazón de Acapulco, en un excelente edificio mantenido, a una cuadra de "Costera" avenida principal, a pocos pasos de buenos restaurantes, tiendas de conveniencia, supermercados, fleemarket. Seguridad 24/7. El personal es amable. 2 dormitorios con aire acondicionado, 2 baños completos, sala familiar, terraza, TV por cable, WIFI gratuito en el interior, recepción 24 horas puede organizar un taxi o puede tomar el servicio de autobuses de la ciudad. El aparcamiento y ascensor. La zona de la piscina que da al mar, ofrecen un amplio espacio para disfrutar de las magníficas vistas. TV por cable en la habitación familiar le permite mantener en contacto con el mundo si decide hacerlo, también puede hacer disfrutar con su amigo con una mesa de billar, o un partido de ping pong. Usted será capaz de sumergirse en la bahía circular de Acapulco enmarcado por los cerros que rodean la ciudad. Las ventanas panorámicas que dan la sensación de mezcla en el océano como usted ve salir el sol a su izquierda y establecer a su derecha en la terraza confortable. Se proporciona una cocina totalmente equipada con una estufa, un horno, un microondas y una nevera. Una doncella está disponible si se solicita. 100% de reembolso para cancelaciones con más de 30 días antes de la fecha de entrada. 50% de reembolso para cancelaciones con más de 14 días antes de la fecha de entrada. This condo is located in La Palladio Condomimium. The overall maintenance of the building and amenities is superb. We had a very large 2 bed/2bath unit which is partially updated and has outstanding views from the large balcony. Full kitchen well stocked. Eat inside or out on the balcony. We loved being spoiled by the Condominium's staff who would set up our lounge chaise, with cushions, adjust the umbrellas and make any minor repairs required. Lots of linens and beach towels and toys supplied by the kind owner, Elena so one could just head out to the pool or beach and enjoy the day. The two very large bedrooms are both air-conditioned. The main living area has two circulating fans and the breeze from the ocean cools it down quickly. Daily temperature hovers around 30 degrees Celsius. There is a Walmart and Soriano close by for your grocery excursions. We used buses (yellow air conditioned ones are best) and taxis to get around. We particularly enjoyed the free Friday night concerts of the Acapulco Philharmonic Orchestra at the Convention Centre. Check their calendar for the next free concert. Safety concerns were just not an issue for us. The military and local police have a steady presence in Acapulco to ensure safety. We stayed in the main tourist areas, bussing to the zocalo and walking to the Cliff Divers. We taxied to Our Lady of Peace chapel built right Ito a mountaintop with an large cross erected that can be seen anywhere in Acapulco. There is a Soriano (grocery chain) within walking distance ; and a Walmart just a bus ride away...both on the main drag. You won't find many beggars or petty theft going on in Acapulco. The Mexican people are so happy and friendly ... it was indeed an idyllic 4 week escape. We really enjoyed our stay in Acapulco. The condominium is spacious, clean, and well equipped with all the necessary. 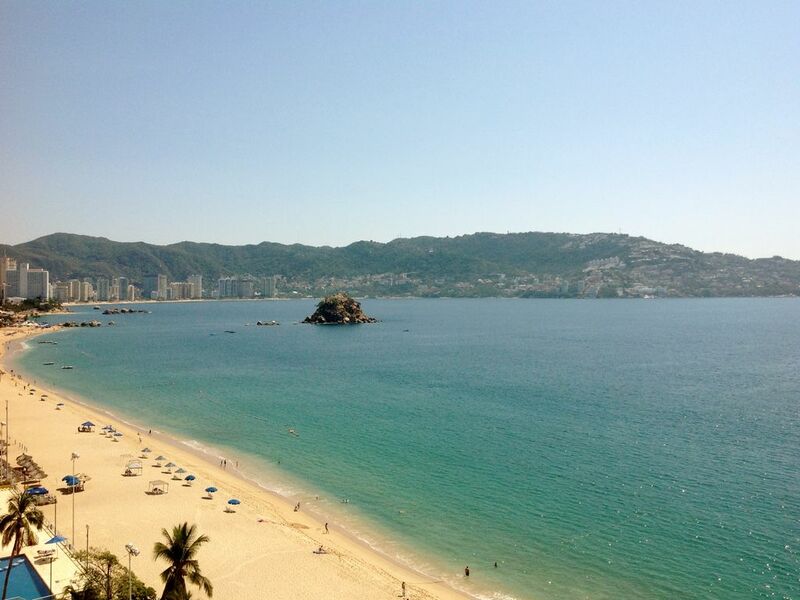 The view from the balcony is very nice, we could enjoy views of the Acapulco’s bay. There are many restaurants and shops close by. The personnel working in the building is very nice and helpful. We spent most of the time at the beach, and if you ask the administration office, they can set up a sun shade and lounge chairs. The pool was great too my nephew was trilled with the slide. This way a nice and perfect vacation. This condo is just marvellous! It is spacious, clean and equipped with everything you need and want. There are even a few straw sun hats to borrow if you left yours at home! Although we never met the owner as she was on vacation, she could be reached quickly and easily by email even during her vacation. She left us the coordinates of her assistant who is a kind and attentive gentleman. He was available, patient and caring. The staff in the building is tremendous! They are helpful and friendly. Any questions regarding where to go or where not to go were answered with great care! We spent four days here with our two children (9 and 11), their grandfather and our teenage niece. The location is great and we essentially had the pool to ourselves for the entire stay. Two popular swimming beaches are five minute walks in either direction from the condo. Since my husband is from Acapulco, it was nice to have a central location for extended family to meet with us that was more comfortable than a hotel room. We had a few misunderstandings about using PayPal but we worked them out with minimal difficulty. I'm used to PayPal being used exclusively with every transaction for VRBO rentals in the US, so I was a little surprised when I was asked to pay for the stay in cash. Lesson learned: Don't assume PayPal is used for the entire process. Elena was gracious and responsive throughout our entire stay and we went home happy. We spent just over 3 weeks in Elena's amazing place. The location is perfect (tons of restaurants and shopping within walking distance), the pool is fabulous, the beach is incredible and the cleanliness of the entire complex is unbelievable. We are definitely returning next year for a full month. Elena was so helpful - restaurant info, markets, etc. We can't say enough about how great things were - we would recommend this condo to anyone! Thanks Elena, see you next year! We had spent a wonderful weekend with our two teens children. The view is spectacular and the swimmingpool amazing. The flat is very well equiped. Acapulco was quiet and calm and the weather, as allways, incredible. Thx Elena for everything. El apartamento está justo al otro lado de un centro comercial, con cines, un alquiler de videos Blockbuster, bares y restaurantes. Hay un supermercado cerca de 1 milla, la estación de autobuses está a 2 cuadras de distancia, así como un hospital privado. Mcdonads es pies de distancia de la entrada. También hay muchos lugares para visitar durante su estancia en la ciudad, el más popular es el buceo en La Quebrada, La Fortaleza de San Diego, la Catedral de la ciudad abajo, parque temático de Papagayo, CICI parque acuático, La Isla Roqueta donde se puede pasar el día bucear y disfrutar de sus muy buenas aguas azules de la playa. También tenemos lagunas para visitar, y una amplia variedad de restaurantes de clase alta, sólo pedimos.